Grain Millers Association of Zimbabwe (GMAZ) has committed to support President Emmerson Mnangagwa’s initiatives and interventions towards containing the cholera outbreak. Speaking during the handover of food stuffs to the Ministry of Local Government for onward donation to affected people, in the capital today, GMAZ chairperson, Tafadzwa Musarara said the joined Mnangagwa in combating the cholera outbreak. ” The milling industry is grieved with the current cholera outbreak and our prayers are with the bereaved families, we join His Excellency the president Cde ED Mnangagwa in combating this menace. “Today we have brought our initial donation collected from our concerned members namely Blue Ribbon, National Foods, Manyame Milling, Nelenty and Alpha Grain. “As the processors of staple foods and key operatives in the attainment and maintenance of national food security, GMAZ has and will remain ready to support all President Mnangagwa’s government initiatives and interventions. Indeed we are solidly behind the president,” said Musarara. 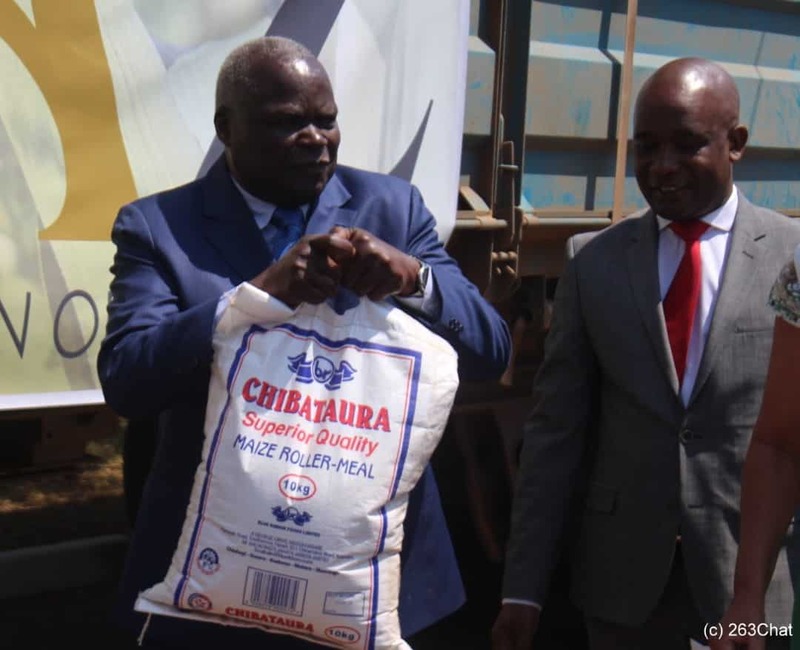 Meanwhile Minister of local government, public works and national housing, July Moyo said the donated food stuffs will be given to the intended beneficiaries in a transparent manner for accountability purposes. “l am greatly humbled to receive the donation of a 30 tonne truck of assorted consignment of food stuffs which include ten tonnes of mealie meal,five tonnes of rice and the biblical 5 000 loaves of the Grain Millers Association of Zimbabwe (GMAZ). “l hope the two fish will be added to make the miracle complete, the donation will go a long way to assist those affected and staff mobilized from other Provinces who are assisting in curbing the cholera outbreak. It is worth noting that in addition to the donation we are receiving today,GMAZ donated 20 000 litres of portable water on Tuesday 18 September 2018 to patients at Glen View Poly Clinic and local residents. “I want to assure you that the donated food stuffs will be given to the intended beneficiaries in a transparent manner for accountability purposes,” he said. Finance and Economic Development minister Professor Mthuli Ncube yesterday rallied the diaspora, the private sector among others to provide both financial and non financial assistance towards the cholera outbreak. GMAZ donated a 30 tonne truck of assorted consignment of food stuffs and staff mobilized from other provinces towards containing the cholera outbreak that so far claimed 30 lives from the more than 5000 cases reported.